GV1 1938 2d mauve sg 191 lightly hinged mint. Year of issue: 1876. Condition: Lightly Hinged. Grade: Fine. Occasionally we all make mistakes, and if we do we fix it. Type: Single. Newly Listed/New Arrivals. Commonwealth & Empire. Collections & Mixtures. 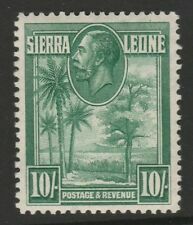 Sierra Leone 1932 George V 10/- Green SG 166 Mint. Sierre Leone. 1932 George V 10/- Green. Fresh mounted mint. Year of issue: 1884. Condition: Lightly Hinged. Occasionally we all make mistakes, and if we do we fix it. Newly Listed/New Arrivals. Commonwealth & Empire. Collections & Mixtures. Year of issue: 1935. Grade: Fine. Newly Listed/New Arrivals. Commonwealth & Empire. Collections & Mixtures. Era: King George V (1910-1936). Year of issue: 1872. Condition: Very Lightly Hinged. Occasionally we all make mistakes, and if we do we fix it. Type: Single. Grade: Very Fine. Newly Listed/New Arrivals. Commonwealth & Empire. Collections & Mixtures. 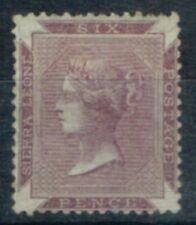 Year of issue: 1859. Condition: Lightly Hinged. Occasionally we all make mistakes, and if we do we fix it. Era: Queen Victoria (1837-1901). Type: Single. Year of issue: 1872. Condition: Very Lightly Hinged. Occasionally we all make mistakes, and if we do we fix it. Type: Single. Era: Queen Victoria (1837-1901). Price: £145.00. 1885 1d Rose-Carmine SG28a. Year of issue: 1885. Sierra Leone. V.F Very Lightly Mtd Mint. Condition: Very Lightly Hinged. Occasionally we all make mistakes, and if we do we fix it. Type: Single. Grade: Very Fine. SIERRA LEONE 1933 KING GEORGE 5TH 6d BLACK AND BROWN-ORANGE SG,175 MOUNTED MINT NICE AND CLEAN CONDITION. Year of issue: 1927. Condition: Very Lightly Hinged. Occasionally we all make mistakes, and if we do we fix it. Type: Single. Grade: Very Fine. Commonwealth & Empire. Collections & Mixtures. Price: £105.00. 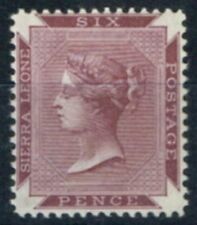 SIERRA LEONE 1938 KING GEORGE 6TH 1.1/2d SCARLET SG,190 LIGHTLY MOUNTED MINT NICE AND CLEAN CONDITION. 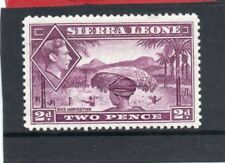 SIERRA LEONE 1932 KING GEORGE 5TH 3d BLUE SG,159 MOUNTED MINT NICE AND CLEAN CONDITION. 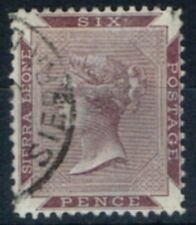 SIERRA LEONE 1938 KING GEORGE 6TH 6d GREY SG,195 MOUNTED MINT NICE AND CLEAN CONDITION. SIERRA LEONE 1938 KING GEORGE 6TH 4d BLACK AND RED-BROWN SG,193 MOUNTED MINT NICE AND CLEAN CONDITION.